This project provides new information on how and where seismic waves travelling through softer soils and sediments in the Montney can be amplified. Buildings and public infrastructure are built to specific engineering building codes to withstand ground motion, but the presence of certain sediments and geological conditions can amplify non-threatening seismic waves to ones which could potentially be a threat to public infrastructure. This project provides information needed for regulators and industry to reduce risk by improving protocols. Some softer soils, sediments and geological conditions found in the Peace Region of northeastern BC have the potential to amplify ground motions. With an increase in seismic activity from hydraulic fracturing and fluid injection at oil and gas sites, it is important to understand how this can occur so that any risk can be reduced and managed. 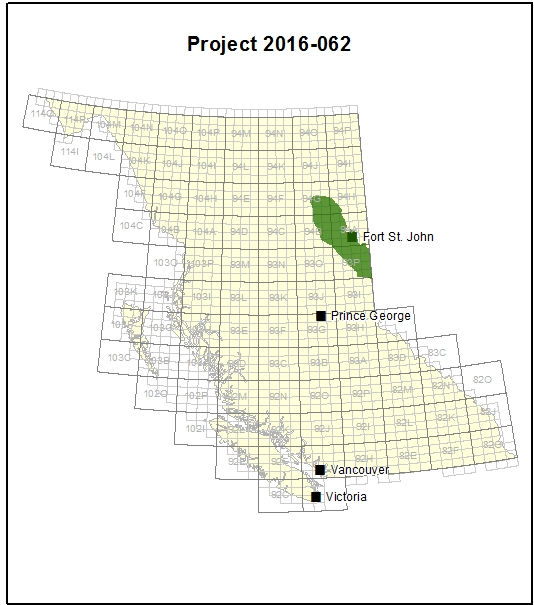 This project extends a bedrock map created in 2015 to include all areas where monitoring of induced seismicity is required by the BC Oil and Gas Commission (OGC). The project also provides geophysical data from multiple sources, including new project-derived data to generate hazard maps for the region. To provide hazard maps that shows how and where amplified ground motion is most likely to occur in the Peace Region. The data provided by this map provides industry, regulators, communities and First Nations with a better understanding of the risks associated with ground motion in the Montney play and Fort St John area. The information will be used to improve industry processes and protocols to manage and reduce risk of damage resulting from hydraulic fracturing and fluid injection used by the oil and gas industry. The Peace Region, including areas around Fort St John and Dawson Creek, where there is significant oil and gas industry activity and infrastructure.